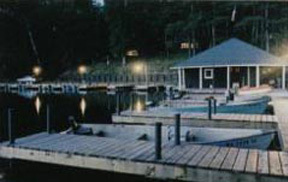 One of the Northwoods Finest American Plan Family Resorts for Over 100 Years. One activity that almost everyone takes advantage of at Boyd’s is fishing, and we are committed to providing our guests with the opportunity to enjoy quality fishing for a variety of species.Â Live bait, tackle, guide service, fish cleaning house, and wrapping and freezing facilities are all available. 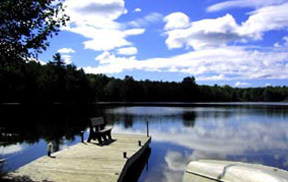 Long Lake is a narrow, 250 acre lake with a maximum depth of 50 feet. It has excellent structure including weed beds, rock bars, steep heavily forested shorelines, and four small islands. Since 1990, Long Lake has been actively managed for walleyes and muskies, and there is an abundance of panfish as well as some largemouth and smallmouth bass. 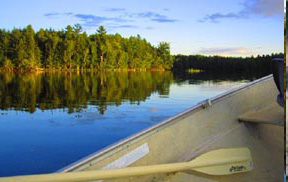 Little Bass Lake is a 58 acre, 41 foot deep lake offering heavily forested shorelines like Long Lake and several rock bars and rocky points.Â It has been managed for walleyes since 1991 and we hope to strengthen the existing smallmouth bass fishery as well. 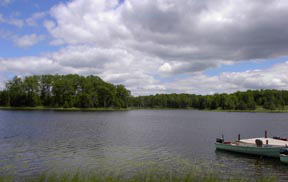 Dog Lake is a 36 acre, 44 foot deep lake located just south of Little Bass Lake, and has a lot of lily pads and a couple of beaver houses.Â Since 1992, this lake has been managed for largemouth bass and bluegills, and is where the kids have the most action. Dave Lake is south of Dog Lake and is a pretty little 21 acre lake with a depth of 35 feet and steep, hardwood covered shorelines.Â This seems to have been an experimental lake over the years, and we have been managing it as a crappie fishery since 1995. All four of our primary lakes were surveyed in 1990 and 1991 by Aqua Tech of Wisconsin, and are now specifically managed for various species of game fish.Â Long Lake is managed for muskies and walleyes, with approximately one million fathead minnows stocked in 1991, 1992, 1993, and 1994 in order to strengthen the existing forage base, and then 1400 walleyes were stocked in 1991 to supplement a poor hatch that spring.Â Dog Lake is managed for largemouth bass and bluegills and received over 700 bass in both 1993 and 1995.Â Dave Lake is our crappie lake and received 600 crappies in 1995.Â Because crappies are voracious minnow eaters, 26 gallons of minnows were stocked in 1993 and another 111 gallons in 1995 to strengthen the forage base.Â At the current time, Little Bass is primarily managed as a walleye fishery, with supplemental stockings of 2044 in 1993, 2900 in 1994 and 3600 walleyes in 1995.Â In an attempt to strengthen the smallmouth bass fishery, we installed 20 half-log spawning structures in 1994.Â We have applied for state approval to install a destratification system on the bed of Little Bass which will increase the oxygen content throughout the lake, thereby reducing the likelihood of winter kill.Â If this is approved, we can then go forward and supplement the smallmouth bass fishery.